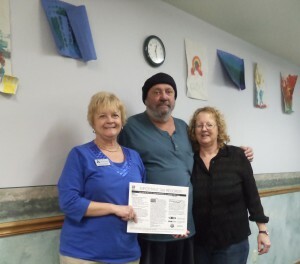 Wautoma couple rewarded for saving a portion of tax return – CAP Services Inc.
From left, CAP Services’ Volunteer Income Tax Assistance site coordinator Connie Henn poses with recent SaveYourRefund winners Gary and Marianne Melka in Wautoma. Gary and Marianne Melka of Wautoma recently won $100 through SaveYourRefund, an incentive-based promotion that encourages income tax filers to save a portion of their refund. The Melkas completed their taxes with help from CAP Services, which provides free tax preparation assistance for income-eligible individuals and families in Portage, Waupaca and Waushara counties and is a SaveYourRefund partner. The SaveYourRefund sweepstakes aims to expand awareness of savings and strengthen families’ finances, increasing their capacity to respond to unforeseen expenses or financial opportunities. Through SaveYourRefund, tax filers over the age of 18 who save a portion of their tax refund can enter a promotion for a chance to win 100 weekly $100 prizes. Entrants can also submit a separate photo entry for the grand prize of $25,000. CAP’s Volunteer Income Tax Assistance (VITA) program has had two $100 SaveYourRefund winners so far this filing season. There is still time to schedule an appointment with VITA’s IRS-certified volunteers for free basic income tax return preparation. In addition to a chance in the SaveYourRefund sweepstakes, taxpreparers will inform taxpayers about special tax credits for which they may qualify, such as the Child Tax Credit, Credit for the Elderly or the Disabled, and the Earned Income Tax Credit (EITC). Call 1-800-660-5430 or visit capservices.org/vita for more information.